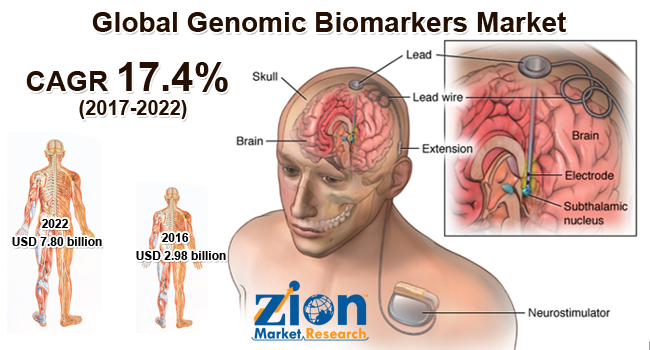 Zion Market Research has published a new report titled “Genomic Biomarkers Market by Indication (Oncology, Cardiovascular Diseases, Neurological Diseases and Others) and End User (Hospitals, Diagnostic & Research Laboratories, and Others): Global Industry Perspective, Comprehensive Analysis, and Forecast, 2016 - 2022”. According to the report, global genomic biomarkers market was valued at approximately USD 2.98 billion in 2016 and is expected to generate revenue of around USD 7.80 billion by end of 2022, growing at a CAGR of around 17.4% between 2017 and 2022. A biomarker is a substance that is introduced into an organism as a means to examine organ function or other aspects of health. A genomic biomarker is in the form of DNA or RNA. Genomic biomarkers are DNA or RNA characteristics, which act as an indicator of normal biologic processes, pathogenic processes, and/or response to therapeutic or other intervention. Genomic biomarkers offer a valuable tool for genetic testing of various disorders that identifies changes in chromosomes, genes, or proteins. The results of a genetic test can confirm or rule out a suspected genetic condition or help determine a person’s chance of developing or passing on a genetic disorder. Robust, reproducible genomic biomarkers are of diagnostic value and help identify causal factors. Thus can be used clinically for diagnosis, to monitor the activity of diseases, and also may be useful to guide molecularly targeted therapy and personalized medicines. Global genomic biomarkers market is primarily driven by growing prevalence of life-threatening diseases such as cancer, cardiovascular diseases and neurological disorders across the globe. Other major driving factors are a need for genomic biomarker-based personalized medicines and their increasing adoption. However, high cost, complex development procedure, and stringent government regulations are the major restraints that may limit the growth of the market. Nonetheless, growing awareness about advantages of genomic biomarkers over conventional methods for diagnosis coupled with a huge investment in genomic biomarkers across the globe is likely to disclose the new avenues for genomic biomarkers market in the near future. The genomic biomarkers market is segmented on the basis of different indications such as oncology, cardiovascular diseases, neurological diseases and others. Oncology segment holds a maximum share of global genomic biomarkers market. Based on the end user, genomic biomarkers market is classified into hospitals, diagnostic & research laboratories, and others. North America, Europe, Asia-Pacific, Latin America and Middle East & Africa are key regional segments of global genomic biomarkers market. North America is anticipated to remain the leading region over the forecast period followed by Europe. Demand for genomic biomarkers was highest in North America especially in the U.S. Asia Pacific is expected to be the highest growing region in genomic biomarkers market during the forecast period. Moreover, the Middle East and Africa and Latin America are also expected to show moderate growth for this market in the years to come. Some of the key players in genomic biomarkers market include Thermo Fisher Scientific, Roche Diagnostics, Myriad Genetics, QIAGEN, Bio-Rad Laboratories, US Biomarkers Inc., Almac Group and Epigenomics AG among others.